Well, it just so happened to be Valentine’s Day while we were shooting episode 5 of Tali Jams New York a year ago. I’ve never actually celebrated Valentine’s before, being the secular Jew that I am (still figuring out what that is—more about religions that contain people who are not religious in my upcoming article about the lesser-known mathematical statement, “Russell’s Jewish Paradox”). Whoops, just lost 20 readers there! (and there were only 15 to begin with). Anyway, attempting to write a thoughtful blog, I actually looked up Valentine’s Day. Because I do not care about it, but I DO care about why people care about it. I know everyone says they don’t care about Valentine’s as a defense mechanism, but I actually do not care—it just wasn’t a thing in Israel. And as evidence, I submit my last Valentine’s activity: cooking chicken, eating chicken, in that order (I love chicken). All this is completely unrelated to this episode. Still, I wanted you to read it, so you can fully appreciate it and be prepared to nail next Valentine’s. I’ll go practice my part (“virtuous rejection”—I guess that means screening some texts? What a fun game. There should be a smartphone version. “Candid Crush”? You’re welcome, Apple). I think boredom is beautiful. You can fill it in with interesting content. Great love stories can come out of very ordinary, yet continuous, interactions between people. Episode 5 begins with my semi-dramatic autobiographical story, “The Great Escape from Italy,” when I ran away from my boyfriend-at-the-time, who I suspected was a tad mentally-ill / passively (or actively) aggressive / just generally creepy, or some interesting combination of the three. Or maybe he just liked women to look him in the eye a lot and tell him that they are not afraid of him? In any case, I had my little James Bond moment, a 12-hour adventure to get away from nowhere in Tuscany (NOWHERE!!! ), to Torino to pick up my passport (don’t leave your passport in your tinder-boyfriend’s parents’ apartment! ), to Madrid where I had a few shows coming up the next week. Technically, we are still together, since the last thing I told him was “I think I need to go, I have to ponder on a few things and take some time alone.” And then I took off (in spite of his strong rejection and his attempt to dictate what was actually going to happen) scared to my bones that he’ll know I’m afraid of him, but acting normal (much more normal than I usually am…). Except one curse in Italian via text over me not answering my phone, and sending his dad’s number so I could contact him to pick up my passport (if you are reading this—THANK YOU for that!!!!!!! This might be the most generous thing anyone has ever done for me), I never heard from him again. And I never contacted him myself. It’s as if we both know exactly what happened there, but also as if it never happened in the first place. The fact we never spoke since (this was almost 3 years ago), not even a word, speaks louder than this story. I think it clearly shows how shocking this event was for both of us. I’ll probably never know his side. Later on in the episode, I go on a date with my at-the-time-current-boyfriend, which is a 180 degrees shift from The Great Escape. This is everything I dreamed and hoped for: Absolutely no drama, a very limited emotional range, that sweet spot between comfort and boredom. I think boredom is beautiful. You can fill it in with interesting content. They say Einstein came up with his best ideas (some of them were really great!) when he was staring out the window for hours, doing nothing. In a similar manner, I believe that great love stories can come out of very ordinary, yet continuous, interactions between people. They enable time to work its magic, without interference. At least, that was my theory then. I change my theories often to suit the circumstances. And the jam session? We went to the Trash Bar, which has closed down since (that’s NYC for you), to play some rock and funk covers with Arthur Neilson, the amazing blues guitarist, who invited us to come to this jam when we met him back in episode 3. This time, completely smitten and appropriately tipsy, I almost started playing the wrong song (I heard the musicians call out the name of a song that I wanted to hear) and I played way beyond the standard solo length (filmmaker Dror Pikielny later told me that every time another player was going to start their solo, I kept going, completely oblivious to the fact that I was taking over). I just had that special feeling that made me unaware, blinded to it all. It wasn’t that I was in love with him… I was just, simply, in love. 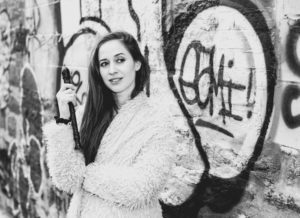 Tali Rubinstein, signed to the prestigious label Casa Limón is gaining international recognition by performing worldwide and breaking boundaries with a seemingly simple instrument—the recorder. She has toured with legendary guitarist Paco de Lucía’ s original band; performed at prestigious venues such as Carnegie Hall, Jazz at Lincoln Center, and the Kennedy Center; and collaborated with top musicians such as Anat Cohen, Mariza, and Alejandro Sanz, among others. She is currently working on her debut album Mémoire, a collection of original songs she has composed and co-arranged.